. . .Closer . . .
My Mixed Media Collage art is meant to be examined up close. Although the presentation of the art as a whole entity should be pleasing to the eye, the details and minutiae of the piece are what makes it special. Look closely. See what you can see. I believe every person is a complicated conglomerate of passion, talent, creativity, genius, and hero. Sometimes we need a little push to let these things out into the world. I hope my art encourages others to believe just a little more in themselves. My art is an extension of my obsession with scrapbooking. I’ve related the lives of all 4 of my kids with intricate, detailed, decorated pages that highlight photos. I’m also keenly interested in poetry. As a published poet, words (their sound, their meaning, and their associations with emotion) are paramount in my life. Most of my art includes words, the emotive element, which bonds with the visual element in art to create a multi-dimensional product. 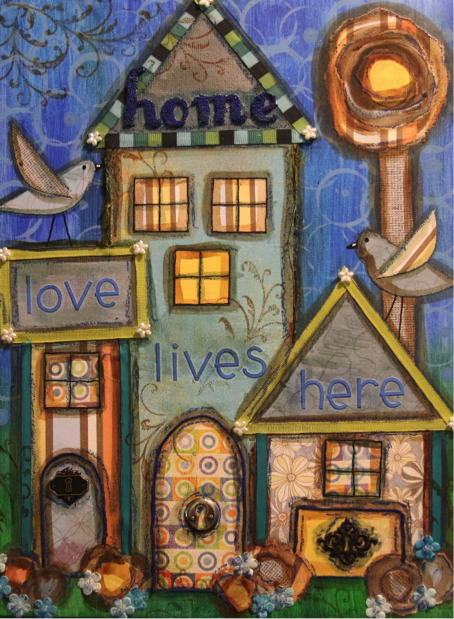 My favorite themes are home, love, creativity, joy, belief in self, courage, and happiness. 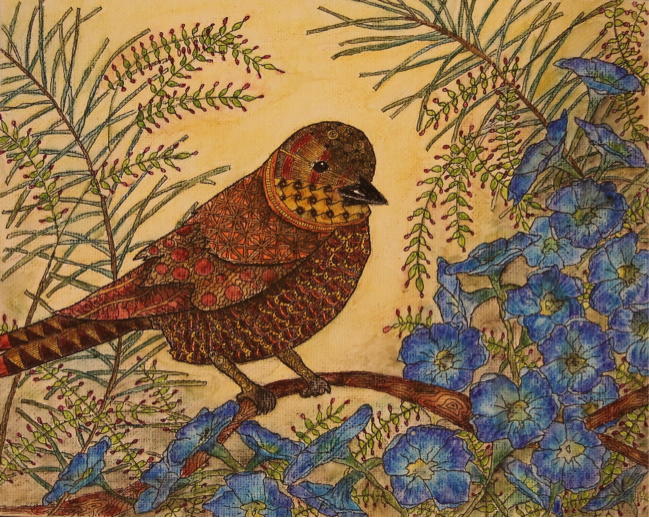 The one specific element you will see in virtually all of my art is birds, hence my Etsy shop’s name, Sparrow House Art. 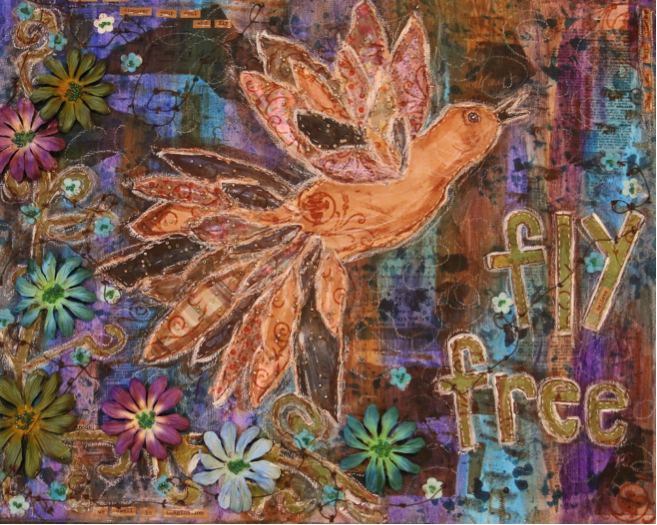 Birds represent freedom, delight, and fearlessness, and connect ethereal emotion (heaven, air) to sturdy, solid fact (earth, ground). My hope is that my art will not only make people happy, but will spark a little light of inspiration so that others might dare to try something new—even if that something new is to let yourself see a little more clearly the magic in you. 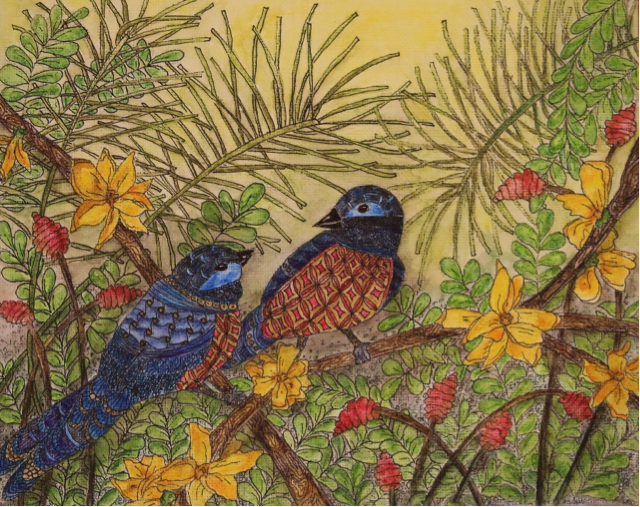 For my watercolor birds on canvas board, I loosely draw the bird and its environs freehand in pencil. I redraw the piece using permanent archival ink, adding patterns called Zentangles, a meditative / doodling type of art, to portions of the birds and natural elements. I apply color using watercolor pencils, then apply water with a fine brush to soften the colors. The final step is to add shadow and shade, blend and blur the color in certain areas, and paint the background. 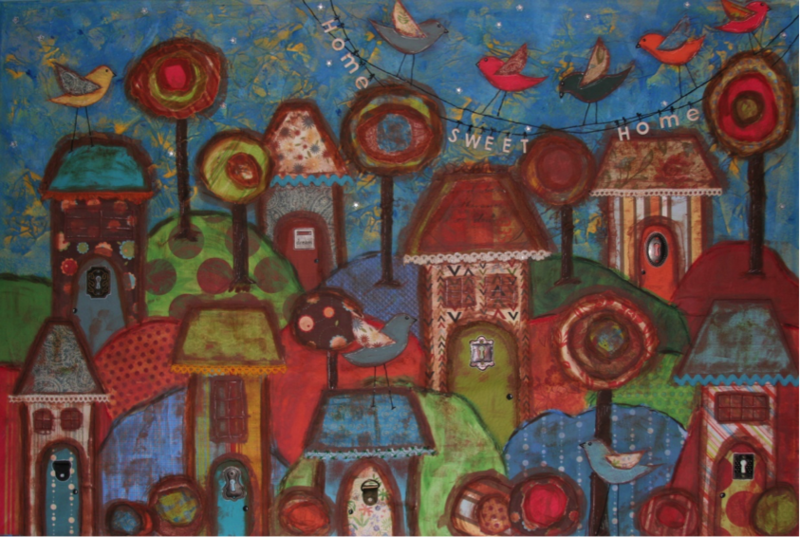 The definition of Mixed Media is this: A technique involving the use of two or more artistic media, such as ink and pastel or painting and collage, that are combined in a single composition. For my Mixed Media art, I paint the background with acrylic paint, arrange and glue down the paper elements, often layering the papers for effect. 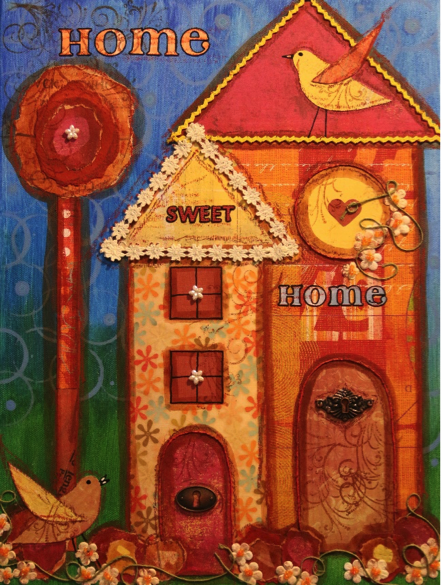 I embellish the piece with fiber, buttons, beads, metal artifacts, paper flowers and stickers. The final step it to use a thin paint to create shadow, oil pastels and ink markers to outline, and stamps and ink to add more detail. I often add words, either as part of the background or as a prominent phrase that defines the piece. Mixed Media really is a cluster of found objects, rearranged to become something new. Visit my work on Etsy by clicking here. Check out Other Cool Birds, where my art was featured.